Hi there, welcome. Today I am going to talk about writing. …and so does writing. The more you write the better you get at it. However, sometimes even the most talented or dedicated writer gets blocked. Assuming of course you believe in writer’s block. I don’t, as such. I think it is just a fancy term for a mixture of boredom and fear. I may come back to that in a bit. Anyway, moving on. 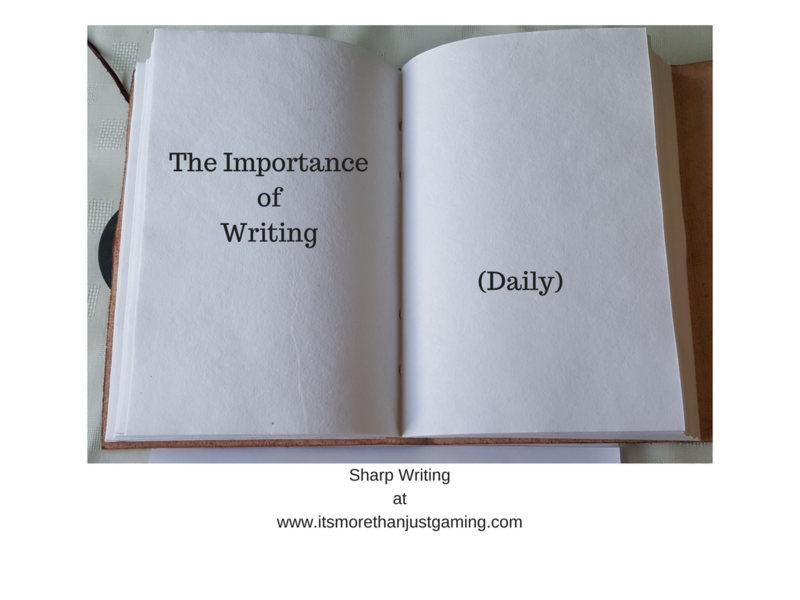 It is (relatively) easy to write everyday when you are feeling positive and when you are feeling inspired. Some people will say that they can’t find the time. I will say, I don’t believe you. You always have some time, however you may choose to spend it doing other things. And I do appreciate there are those out there with families and other jobs that demand a lot of their time. My comments here are not really aimed at that demographic. I daresay those folks could find some time to write, but perhaps in their case free time is a rarer commodity. I am talking about the folks that do have plenty of time, but choose to spend it doing other things. Tell me you don’t have free time and I will tell you that you are undisciplined. That is something that people don’t always get at the outset. If you are wanting to make a living from writing, or maybe you aren’t interested in a living but you want to publish a novel, then you need to be disciplined. With discipline you can find the time to devote to your craft. So, now we have time. But we aren’t feeling up to it. Being disciplined helps here too, however that isn’t everything. After all, particularly if fiction is your forte, you are making stuff up and if you are feeling uninspired then, where do you start? For some people it is free writing from a prompt, which if you don’t understand what that means it is fairly straightforward. A writer is given a prompt, the start (or part of) a sentence and might start a paragraph using it as their first line. Or As a line in the paragraph, or not at all and just writes what the prompt makes them think. The important factor is that the writer takes the prompt and writes. They don’t self edit, they don’t stop; they just write. What comes out might be chaotic, it might be nonsense or it might be the start of something unexpected. It doesn’t matter. The quality doesn’t matter either at this point. If the writer has been able to write anything, then the exercise has been a success. That is free writing from a prompt. Another method, that I personally find helps, is keeping a writer’s journal. I find I am at my most prolific if I keep a journal every day about my writing. Obviously if you spend your entire Saturday writing 3000 words of decent quality work, you aren’t necessarily going to want to spend loads of time writing about it. If you are keeping a journal, enter the date and write down you wrote 3000 words on whatever topic it was you wrote. That is enough. However, the power of the journal comes into its own on those days you don’t write 3000 words for your novel or your script or your blog. On those days I tend to start writing what I think about my work, start talking to myself on the page. I write down what I want to do, asking myself “What are the consequences of this?” And then I answer myself. I might spend 500 or 1000 words talking to myself through the keyboard exploring an idea, and by the end of it I may be happy. Or I may be closer to a solution. Or maybe all I have done is figure out that something doesn’t work. The key thing here is I was able to write. I mentioned earlier I don’t really believe in writer’s block as a concept. I humbly suggest that journal writing is a potential solution in two ways. Regardless of immediate solutions, keeping a journal forces you to write which functions as a warmup exercise, focusing your mind. I think I have arrived at the point I originally set out to make. The purpose of this article was to encourage folks to write daily, and provide an answer for how to do that when it is difficult. However, it is ultimately down to you – the individual – if you feel you can do this. It is not for me to say what you should or should not do. Only that my method as described has helped me, and I believe it can help others. Just one final thought to ponder. Imagine you wrote in a journal 500 words every day for a month. In a 30 day month that is 15000 words, which equates to about 50 pages of a paperback. 500 words doesn’t take long to write once you are in a flow. Maybe 30 minutes? (It takes 30 minutes for me). Now imagine, if that 500 words wasn’t in your journal, but your novel manuscript. You’d have a decent length first draft in 6 months, spending half an hour a day. Still think you don’t have time? What are your thoughts on writing everyday? I’d love to hear them.